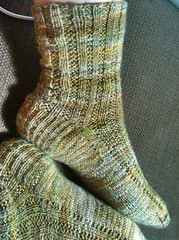 While I was in Bhutan I finished another pair of garter-rib socks. For such a simple pattern I made an exceptional number of mistakes. Despite that the socks fit fine. The Pagewood Farms Yukon yarn in the Camo colorway was lovely to work with originally, but since I’d previously tried it with two other patterns, it was a bit splitty by now. 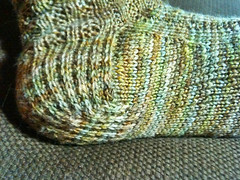 I have started continuing the slip stitch heel around the heel turn and onto the bottom of the heel for a more cushioned sock. Occassionally I need to insert a short row when I do this to accommodate the slip stitch being shorter than the pattern on the insole. 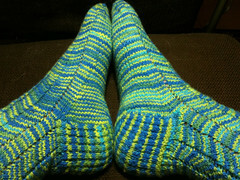 My BroadRipple socks are also done. They are made from Cascade Fixation Spray-Dyed Effect yarn in the Pacific colorway. 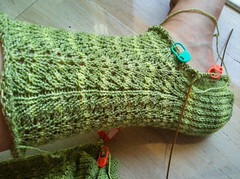 I finished the first pair of Waving, Not Drowning socks and am working on a second pair. Much to my surprise, the Lana Grossa Meilenwett Cotton yarn (color 7002, lot 52219) that I thought was a variegated single color has a stripe in it. I had wanted to make these in a solid color to better show off the pattern. I don’t think these are doing that. They look better in the photo than in real life. This seems to be my year for learning how to (or how not to) effectively pair yarns with patterns. I’ve been largely knitting multi-colored colorways into patterns that would look better with a solid yarn. This entry was posted in FOs, socks. Bookmark the permalink.